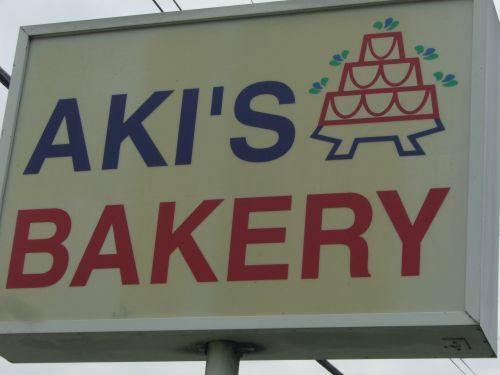 I had heard of Aki's Bakery years ago as it is quite a fixture in San Jose, serving the community since the 1960's. My Honor's World History/ AP US History teacher in high school would rave about and of course I remembered to add it to my "to visit" list. 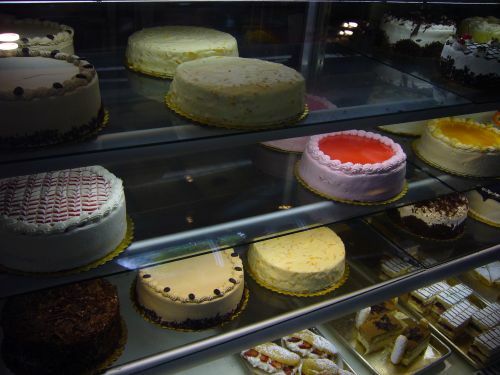 However, I never mentioned it when I was living at home since I figured nobody at home would be down for venturing away from the Chinese style cakes they were so familiar with. Recently I felt my family became be more open to venturing into new styles of cakes so I suggested it and it was an emphatic go. DV and I arrived bright and early before opening but as you can see... there were others anxiously awaiting to grab some goodies. Parking is very limited in the front to street parking so we decided to park in the back where there was plenty of parking since we were driving the parents' shiny new car. Once we were in, we were overwhelmed by the choices. Look at all the cakes! All so pretty and yummy looking. We managed to be first in line and considering there were several patrons waiting behind us, we decided it'd be wise to not step out and wave people on. So we stepped up to the counter and the attendant was great at helping us to find the cake we were looking for. 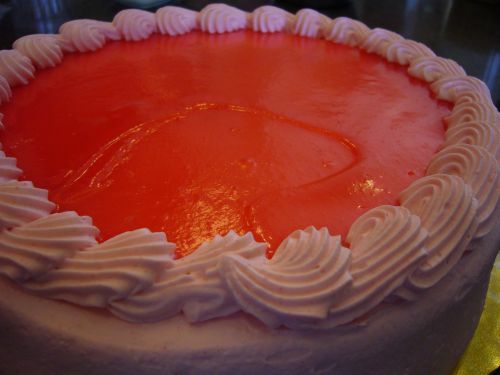 Specifically we wanted a cake low in sugar yet wasn't plain tasting and the signature guava cake was recommended to us. This pink treat consists of two layers of guava chiffon cake, filled and iced with guava whipped cream and topped with a light guava puree. The attendant said it was imperative that we put the cake back in the fridge if weren't going to eat it within the hour so we did as we were saving it for after lunch. Check out that slice! 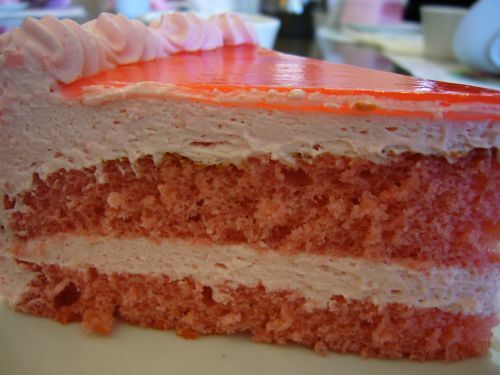 The cake layers were light and fluffy... and had a delicate guava flavor. I'm such a fan of whipped cream as it is airy...making it less of a guilt trip to consume than butter cream or cream cheese frosting. This whipped cream icing was no different and again lightly flavored with guava. When I first saw the guava puree, I was a little skeptical that it wouldn't be overly sweet. But it really wasn't and provided a lovely different texture to the cake. I won't be back in the Bay till probably Thanksgiving and I'm thinking of hiting this bakery again once I'm back.